Today’s author interview is with Lara Fawzy, a global marketing specialist and business writer. She authored together with Lucas Dworsky a non-fiction guide book to “Internet B2B marketing in emerging markets” worldwide. It is not only a valuable source for economists and businesses, but also an amazing textbook, describing marketing models, and concludes with detailed case studies showing the ebocube model at work, driving real profits. It’s the first comprehensive guide to Internet B2B marketing in emerging markets, introducing ebocube model, a framework and methodology business leaders can implement with low-risk and high reward to penetrate the world’s fastest-growing markets, and create significant value where it never existed before. 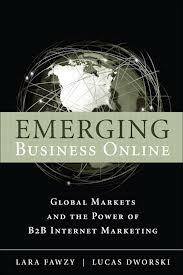 The book begins with an up-to-date introduction to emerging markets, including economic potential, languages, culture, time zones, economies, politics, and Internet/mobile penetration. Next, the book covers best practices for branding, distribution, segmentation, and collaboration in emerging markets. Then, in the heart of the book, the powerful, three-phase Internet-based B2B marketing and sales model “ebocube” is introduced. Readers will learn how to establish metrics and dashboards to stay on track through the entire B2b buying cycle; how to plan and manage campaigns, from selling propositions to media mix; how to utilize email, webcasts, websites, social media, and banner ads in emerging markets; how to mix in offline media and channels; how to budget and manage marketing operations and much more. The book concludes with detailed case studies showing ebocube at work driving real profits. Emerging Business Online brings together powerful lessons and techniques that are being applied successfully by Cisco and other global leaders. Don’t struggle with trial-and-error approaches to Internet B2B marketing in fast-growth emerging markets. Begin with a blueprint that works: ebocube! The model is called ‘ebocube’, which stands for emerging business online, with cube referring to the visual framework of the three-phase model. Phase One: The Dashboard and the Datacube. This phase focuses on reporting on marketing, sales, and company or contact data for the businesses being targeted in emerging markets. It measures what’s working (or not working) and which market is generating the highest return on marketing investment (ROMI). 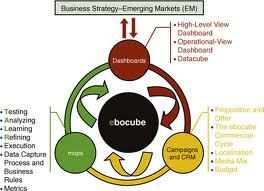 The datacube also represents the quality of contact data to leverage an eCRM strategy. These reports mean business decisions are not based on instinct or assumption, but on numbers and business intelligence. Using the ebocube commercial cycle (contact buying cycle/decision-making process and data life cycle), phase two discusses the proposition, messaging, the incentive, localization, budgeting, and integrating the media mix (online and offline) to achieve ebocube commercial cycle goals. Phase Three: Marketing Operations or mops. Phase three covers budgeting, planning, executing, tracking, and measuring campaigns to feed the dashboard with meaningful metrics. It also demonstrates how to feed your company database, with contact and company data, which can be represented in the datacube. Phase three closes the loop on marketing, data, and sales in global markets. A new-generation technology prompted us to write this book that technology is telepresence, the next generation of videoconferencing technology. Telepresence uses the Internet to transfer conference calls as well as high-definition images and presentations. It can provide life-size images and surround sound and can thus create the illusion that all the attendees are in the same room. Holographic videoconferencing is an application that appears to beam three-dimensional images of people into a room. This is but one example of existing and emerging technologies that present an effective and responsible alternative to world leaders and business executives who currently fly around the world and ride in limousines to meeting locations. Digital and information technologies are allowing businesses in emerging markets to dramatically upgrade their business processes and operations. As billions of people now access the Internet, emerging nations and markets are increasing their investments in these technologies to give people greater access (and speed) to information. This book explores how and why the Internet and related technologies are redefining how we all conduct business globally. We identify the most salient new ideas shaping the global information marketplace, and explore how these offer government and private sector managers a new generation of digitally based management and communication tools and how businesses in developed markets can develop, emerging, fast growth markets. Thinking way back to the beginning, what’s the most important thing you have learned as a writer from then to now? Considering a book from the first word you write to the moment you see it on a bookstore shelf, what’s your favorite part of the process? What’s your least favorite? Probably the title would need to be changed, although I like it, I could play with it forever as a marketer. My publisher has a lot of control over the book, pricing, design etc, there are a few things I would have liked to have changed that were advised to us by the publisher. Perhaps I would consider self-publishing in the future. How did you get published? Please share your own personal journey. We good published by a major publishing house in New York, the FT Press Pearson, ironically Pearson UK rejected our manuscript. The formula included persistence, a very good proposal, targeting the right people at the right time and having a marketable content. What general advice do you have for other writers? Start with a good structure and then write when you can, in the evenings, after work on the weekend, don’t give up if you feel you have viable idea or good business idea or novel. Your vision is totally realistic even if no body else shares it. What do you find is the best part of being an author? Being an author for the FT press gives me a lot of credibility in the business world and has opened doors for me, more importantly, I believe anything is achievable if you commit and persevere. Writing blogs and sharing on social media, mainly LinkedIn. What’s one thing that your readers would be surprised to know about you? I’ve climbed the highest mountain in Southeast Asia, Mount Kinabalu half the size of Everest, it’s my second biggest achievement after publishing my first book! Learn more about Lara Fawzy and see her remarkable posts @LaraFawzy, for everyone interest in marketing, digital business and geo-politics. Please feel free to check out all previous posts of this blog (there are 750 of them : ) if you haven’t already. Why not sign up to receive them regularly by email? Just click on “Follow” in the upper line on each page – and then on “LIKE” next to it. There is also the “SHARE” button underneath each article where you can submit the article to Pinterest, Google+, Twitter, Chime.in, Facebook, Tumblr and StumpleUpon.